In this section you will find resources relevant to Women's Fashion. Can you learn everything you want to know about women's fashion from this page? Probably not. However, this can get you started in the proper direction. Visit our style blog to learn more about women's fashion trends. Do you want to shop for women's apparel, footwear, or accessories? Women's Clothing Stores - clothing store directory for women's clothing and fashion accessories. 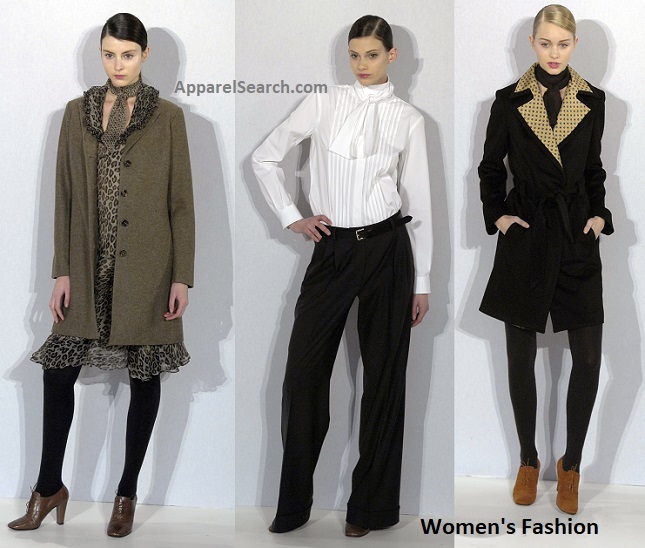 Women's Clothing At Auction - find the latest women's fashion on auction. Womenswear Fashion Directories and Guides - the fashion industry has publishing companies that organize womenswear buyers guides and salesperson guide to assist buyers or women's clothing and sellers of women's clothing. The books are usually not cheap, but well worth it if you are involved with womenswear. Fashion Industry Network - network for women and men that have a strong interest in fashion. Women's Wholesale Clothing - apparel industry guide for finding women's clothing wholesalers. This directory is for apparel retailers to locate distributors to sell to their stores. Women's Jewelry - well, it may not be clothing, but jewelry is always in fashion. Beauty - women typically wish to look their best. On occasion, this may requires a bit of cosmetics. Makeup and skincare is not officially a fashion accessory. However, we thought it may be helpful to the women of fashion. Women's Fashion Brands - are you looking for a hot new fashion label or possibly a classic designer brand? You can find many types of women's fashion brands from this designer label guide. If you have an interest in writing, you are welcome to write about women's style and fashion at the Fashion Newspaper. Also, if you currently work in the apparel industry, you are welcome to discuss clothing and footwear for women at the Fashion Industry Network. By the way, when searching for women's fashion, the fit of the garment is very important.